It was a great race. It was one of the best races of the year. Maybe the best race of the year for the series. “It was a good race. But not the type of good race I’d like to be involved with,” added Loftin, with a smile. 1. (8) Brian Loftin, Lexington, N.C., Chevrolet, 150, $1,925. 2. (7) Frank Fleming, Mount Airy, N.C., Pontiac, 150, $1,425. 3. (5) Tim Brown, Cana, Va., Chevrolet, 150, $1,225. 4. 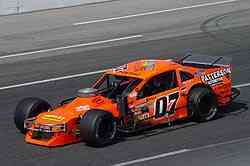 (14) Brian Crammer, Howell, N.J., Chevrolet, 150, $1,150. 5. (12) Jason Myers, Walnut Cove, N.C., Pontiac, 150, $1,000. 6. (3) Junior Miller, Pine Hall, N.C., Dodge, 150, $850. 7. (4) Burt Myers, Walnut Cove, N.C., Chevrolet, 150, $750. 8. (9) Brian Pack, Walkertown, N.C., Pontiac, 150, $690. 9. (10) Bobby Hutchens, Lexington, N.C., Chevrolet, 149, $590. 10. (11) John Smith, Mount Airy, N.C., Chevrolet, 148, $550. 11. (15) Gene Pack, Walkertown, N.C., Pontiac, 147, $525. 12. (16) Jay Mize, Clemmons, N.C., Chevrolet, 146, $500. 13. (13) Lee Jeffreys, High Point, N.C., Dodge, 131, overheating, $470. 14. (1) Michael Clifton, Walkertown, N.C., Chevrolet, 131, clutch, $430. 15. (17) Kevin Powell, Winston-Salem, N.C., Ford, 122, accident, $410. 16. (18) Joe Lucas, Riner, Va., Chevrolet, 118, accident, $390. 17. (6) Jay Foley, Stuart, Va., Chevrolet, 113, engine, $375. 18. (2) Jay Hedgecock, High Point, N.C., Dodge, 38, overheating, $350. There were plenty of story lines to Saturday night’s 150-lap NASCAR Southern Modified Tour race at Motor Mile Speedway (VA). There was the story of Junior Miller and Burt Myers. 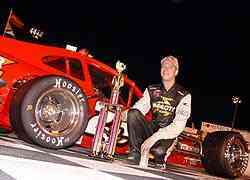 The two Southern Modified Tour point leaders each struggled on Saturday night at the half-mile track. They made multiple pit stops to adjust on their ill-handling cars, and both finished outside the top-five, leaving the championship fight coming down to the final race of the year at Ace Speedway. There was the story of Tim Brown. Brown, a Virginia native who had never raced at Motor Mile before, raced his way to the front and held the top spot for much of the night, racing on the bottom groove, something that no one else figured out, before finishing third. There was the story of Michael Clifton. Clifton started from the pole position and led more laps all race than anyone else. However, during a late race accident, he fell out of the race with transmission problems, ending his bid for his first-career NASCAR Southern Modified Tour win. Myers. Both drivers started at the back of the pack, but with patience and persistence, moved their way to the front, both finishing in the top-five. But the story of the night to follow was the story that unfolded between Brian Loftin and Frank Fleming over the last 15 laps. Loftin, the nights fastest qualifier, started the race eighth after the redraw. Fleming, who has been coming on strong late in the season, was having the his best run to date. A caution on lap 132 and a lap 139 restart set up the story of the night. With Loftin in the lead and Fleming running second, the field came out of turn four, ready to take the green. When Loftin hit the gas, Fleming and third-place runner Brown went right on by Loftin’s #23. That mistake gave the lead to Fleming with just about 10 laps to go. Loftin worked to get by Brown, then set his sights on trying to catch Fleming, who had been able to pull out to a decent lead as Brown and Loftin battled. As the laps clicked down, Loftin drew closer. Fleming counted the laps down behind the wheel. As the white flag flew, Fleming still led Loftin. Through turns one and two, he led Loftin. Down the backstretch, he got a little bump, allowing Loftin to pull alongside. Through three and four, Loftin made the pass, came off of turn four and got the checkers, just ahead of Fleming. For Loftin, it was his series-best fourth win of the season and second in a row. With such a good car, did Loftin ever think he let the win go? Frank Fleming (left) shakes the hand of race winner Brian Loftin (right) after a wild last couple of laps. “I never count myself out in a race car. You always have to give it all you got, 110-percent and go, go, go. My spotter kept me calm, or I would have probably burnt up my right rear tire trying to catch him. I never gave up. For Fleming, the whole final 10 laps happened fast. But even without the win, Fleming was happy just to be in the hunt for it. It was Loftin's fourth win of the season. “I don’t know what happened to Brian on that last restart,” said Fleming. “I don’t know if he missed a shift or spun his tires or what. I jumped by him on the outside though. He was a little bit better than I was though and I knew that once I got by him. So I had to take advantage of his problems. I had to run it for all it was worth. “Those last two or three laps, it was just getting loose on me. He was right on me though. So I slowed it down and tried to keep it on the flat part of the race track. Then, he put the bumper to me. I don’t much blame him either. If I would have been in that situation, I would have done it too. That is just the way it is. I’m glad that he won the race and I’m glad that I’m back to running second.